This blog is part of our complete SQL Tutorial. For training with real trainers, have a look at our SQL training courses. 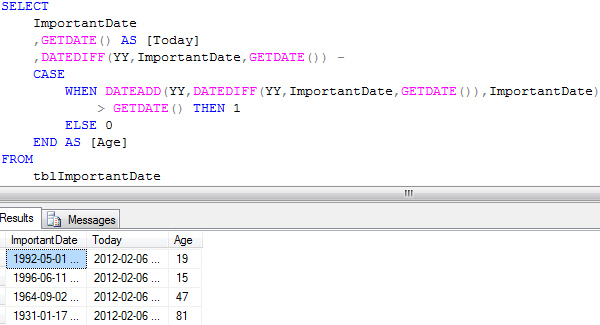 The most accurate way to calculate age in SQL Server. 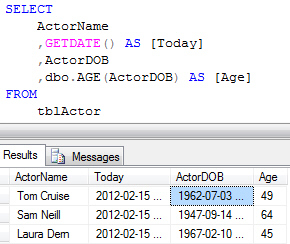 The expression is quite difficult to read, but it is the most accurate way to calculate an age in years in SQL Server. The most annoying thing about this method is having to type out the enormous expression each time you want to use it. A neat solution for avoiding finger-ache is to create a user-defined function that you can then call upon each time you need to calculate age. This article isn't meant to be a comprehensive tutorial on creating user-defined functions in SQL Server; for that you'll want to look up the relevant article on our SQL Tutorial page. If you want to specify a database in which to create the function you can add a USE statement to the top of the code. If you do this make sure you add the GO command immediately afterwards, as shown below. Without the GO command your code will not work. You can run this code in the same way that you would run a query: press F5 on the keyboard, or click the Execute button on the toolbar. If you've done everything correctly you should see this text in the Messages window. 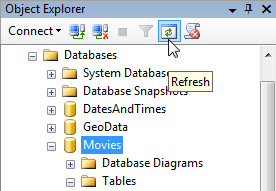 Select your database in the list and then click the Refresh button at the top of the pane. 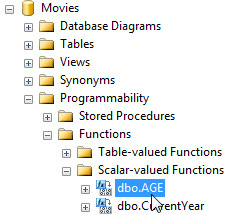 You should now be able to find your function in the relevant folder within your database. You'll have to dig quite deeply into the structure of your database to find your function. Using a user-defined function in a query is exactly the same as using a built-in function, except for one thing: you must precede the name of your function with the schema name. Make sure to add the name of the schema (here it is dbo.) to the front of your function, otherwise it won't work. The great news is that you'll never have to type out the long expression to calculate age ever again!